After the nigh in San Antonio, we still had a long way to drive towards Arizona. The Americans are telling us that we are really courageous to drive all those miles. When we left San Antonio, we consulted each other and we decided to do a little detour. 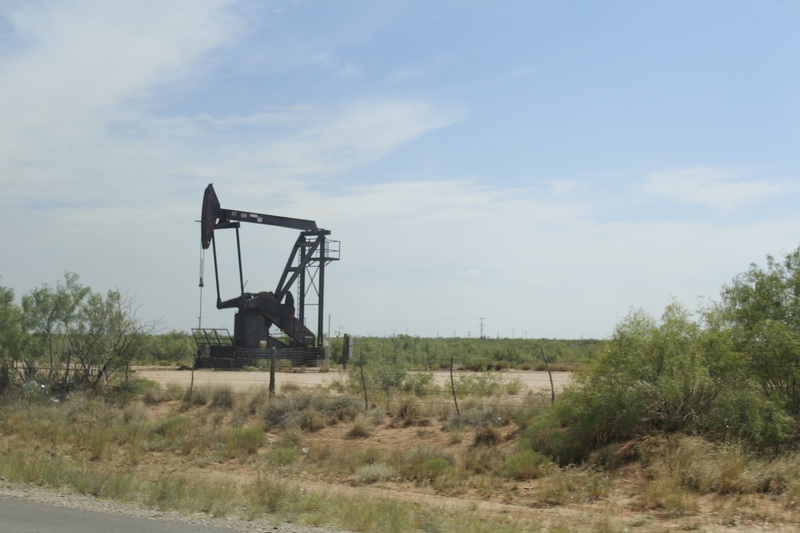 On our initial plan, we were supposed to go to Odessa Texas. Why? Because both of us are really big Friday night lights fans (the book, the movie and the TV show). So we headed north by a small road and what a view we had. Oil wells everywhere and small towns that always show their pride for their local high school football team. 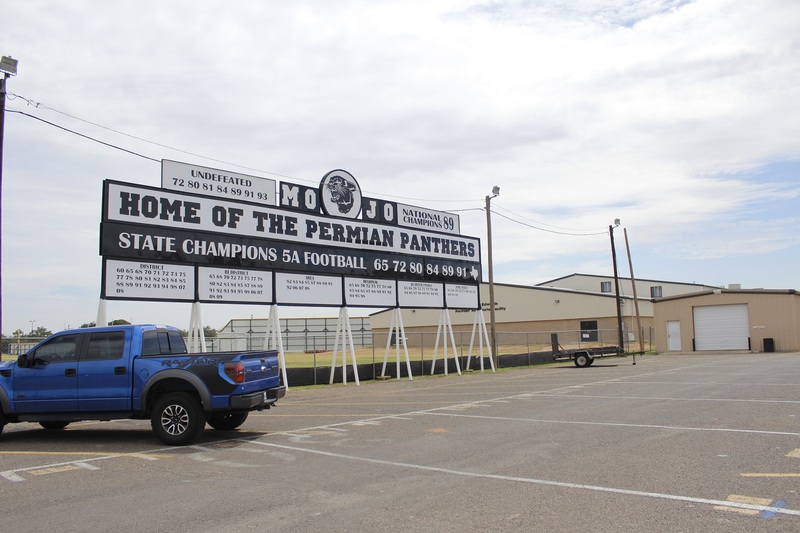 We drove down to the practice field and the stadium of the Permian Panthers ad we took some pictures. We took the road through Texas. The GPS brought us by El Paso Texas, frontal city of Mexico. While driving, we saw the border patrol arresting people on the side of the road. It was probably people crossing the border illegally. This is a big problem and the south of the United States. So we got into New Mexico and first thing, we had to go through a Border Patrol control station. It was raining hard that evening so we had to slow down. We stopped in a Wal-Mart parking lot near Tucson. We couldn’t see what was surrounding us when we stopped because it was night time and there was not a lot of light where we stopped. What a surprise when we woke up and looked around us: we slept in a kind of desert! Still, we had a good night sleep and we were really close to Phoenix. Before checking in our motel (we’ve been told that it would be impossible for us to sleep in the van in Phoenix because of the heat), we headed to ABC15, a local TV station in Phoenix. There we met up with Kevin. Kevin grew up in New York and attended his first Expos game in 1970 at the Shea Stadium. He attended game in Parc Jarry and Stade Olympique. He also followed the team on several ballparks in the United States. In 1985, he even proposed to his wife during the 7th inning stretch at the Big O! Today, Kevin is working for ABC15 and also for the Oakland A’s during their spring training in Arizona. He told us a lot about how much a game in Montreal was a happening that was unique and couldn’t be reproduce anywhere. The particular emotion of the French speaking fans, the bilingual PA announcer and food vendor (bière froide cold beer! ), etc. Kevin told us that one of the things that didn’t help the Expos was the way the baseball commissioner works now. Back then; this job was created to be a neutral position between the players and the owners. Today, we feel that the owners have more power (especially when the commissioner is on ex owner!). The league also divided baseball in two: large markets and small markets. Montreal was on the small side. Also Kevin explained that the political and social climate in Quebec during the 90’s didn’t help at all. The Anglophones of Montreal where a big portion of the Expos fan base. Kevin had a surprise for us: he managed so that we could be on TV for an interview on the next morning! We’d like to give a big thank you to Kevin; it was so nice of him to make all of these efforts for us! 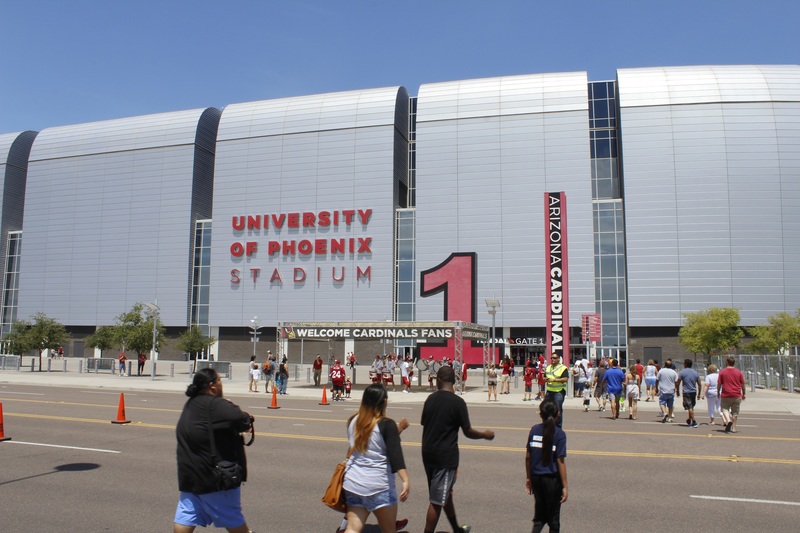 We were looking for something to do in Phoenix and we saw that the Arizona Cardinals, an NFL team, were holding their fan festival day and a public practice for their training camp. 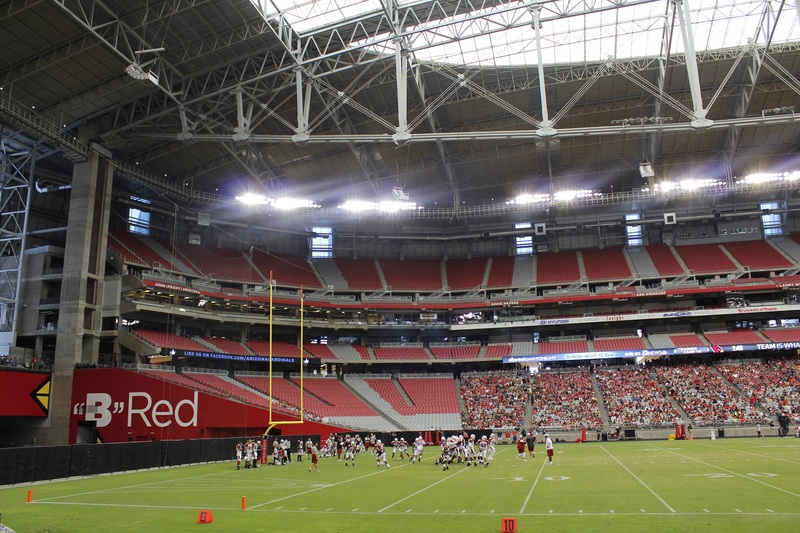 So we went to the University of Phoenix stadium: a huge indoor stadium. We sat real close to the field (seats we won’t be able to afford in our lifetime) to get a good view of the action. After we got back to the motel, we had a few hours before going to the game at 1PM. So we decided to walk a little bit around Phoenix. We had been warned: nobody is walking outside in this city because of the heat. Most of the stores were closed but we still managed to see some nice architecture. We walked towards Chase Field, which is in the downtown area of Phoenix. Once again, we had a game in a ballpark with a retractable roof (first ballpark with that feature that also uses natural grass for the field). We could understand why with this Arizona heat. They have a remedy for that: an enormous AC unit that cools down even when the roof is open! 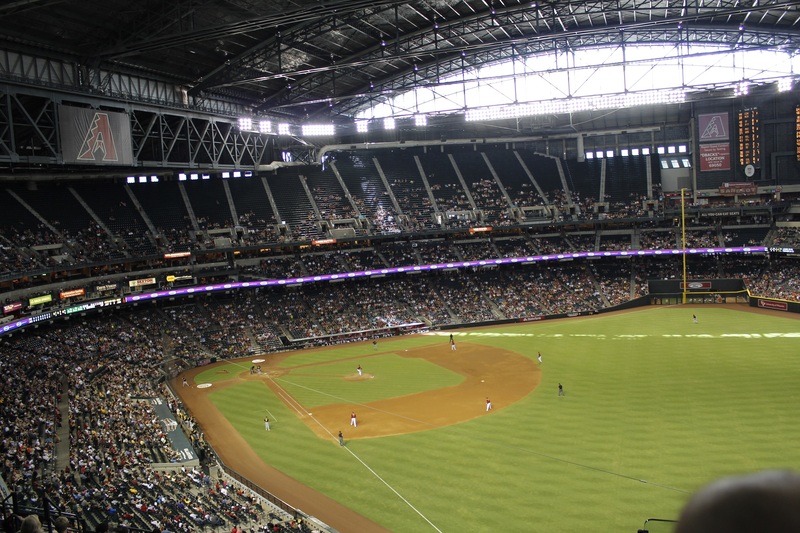 The ballpark was built in 1998, right in time to host the first game of the new Arizona Diamondbacks franchise awarded by the league. It was built on the site of an old airplane hangar: the roof reminds us of that kind of building. The big windows near the roof don’t let as much light in as some of the other retractable roof ballparks. Also the colors used for the hallways are making the ballpark kind of dark and we could think that there is not enough lightning inside. So we toured the park by ourselves to see the different features. On the top deck, there is a big kids section with a playground and a zone so kids can interact with the mascot. Also there is a big TGI Friday’s restaurant with a view of the field. On the main concourse, we found a big section with picnic tables. Really useful when you’re with kids and want to eat and watch the game without making a mess! 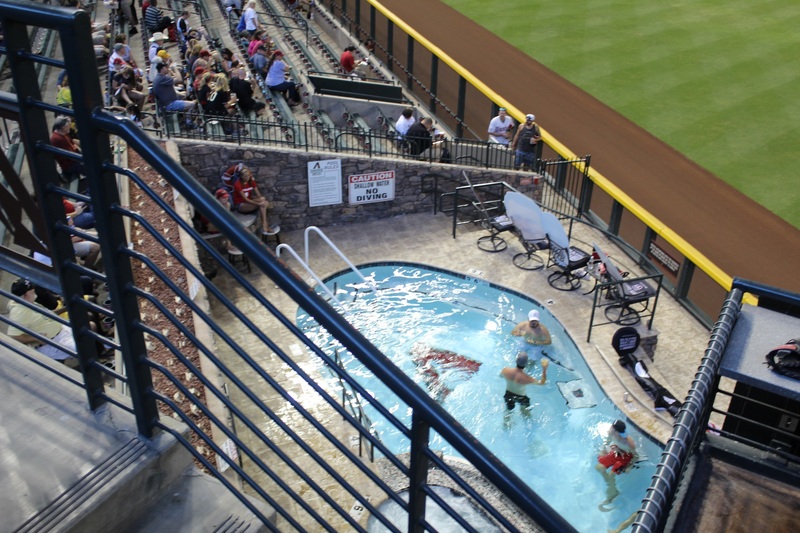 The most popular feature at Chase Field is the Pool: situated in right field, the pool and spa can host 35 persons and is always sold out! Players already have celebrated a win by jumping in it after a game! We also appreciated that the food stands were selling smaller portions at the reasonable price of 1.50$ and the small beer at 4$. It is the first ballpark that we have visited that had this kind of ‘’value menu’’. Outside the ballpark, the team built a 2001 World Series zone with pictures and a loop video of the last out here at Chase Field. Also, in the lobby that led to the team offices, you can take a picture of the World Series trophy replica. Talking about this lobby, we went down there to meet up with Josh Rawitch, VP senior of communications with the Arizona Diamondbacks, so he could tour us inside the ballpark. We didn’t know it was a behind the scenes tour! We started with the team offices. 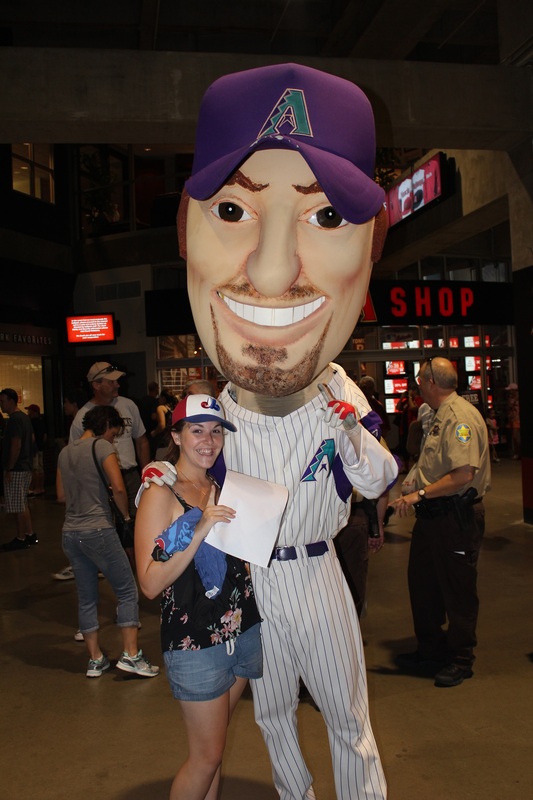 The Dbacks are really working hard on employee’s appreciation so we saw a lot of employee of the month pictures. Josh brought us to his office to give us t-shirts celebrating the 10th year anniversary of Randy Johnson’s perfect game (former Expos!). We went down to field level where we saw pictures of the 2001 world series, starting lineup of each opening day and team players that have played in the All-Star game. Josh showed us the post-game conference room where he invited us to sit and take pictures! We then went up on the press gallery where he introduced us to Journalists and other employees. We had a quick sneak peek in the General Manager’s box and we headed to the control room. In this room, a bunch of people are managing, the video screen, the replays, the score, ball and strikes count, etc. Those people were working really hard and they took the time to write down our names so they could show it on the video screen during the game. Last stop, we headed down again to field level where Josh made one of our dream of the tour come true: we could walk on the field and take a few pictures out there! It was a really nice moment for us, being on a major league field is something we both wished for! During the tour, we had a nice chat with Josh about the team and the ballpark. For an expansion team in 1998, it was a great achievement for the Dbacks to win the World Series in 2001 (youngest team in modern era to win it). It gives us hope in Montreal since we know new teams usually struggle in their first seasons. On the other side, Josh told us that the team spent so much money to get a team to win the World Series that they had to spend the next 10 years rebuilding. A championship title but at which price. Talking fan attendance, the team got a respectable 24,000 fans average this year. Not too bad when we think about the disastrous last years of the Expos. 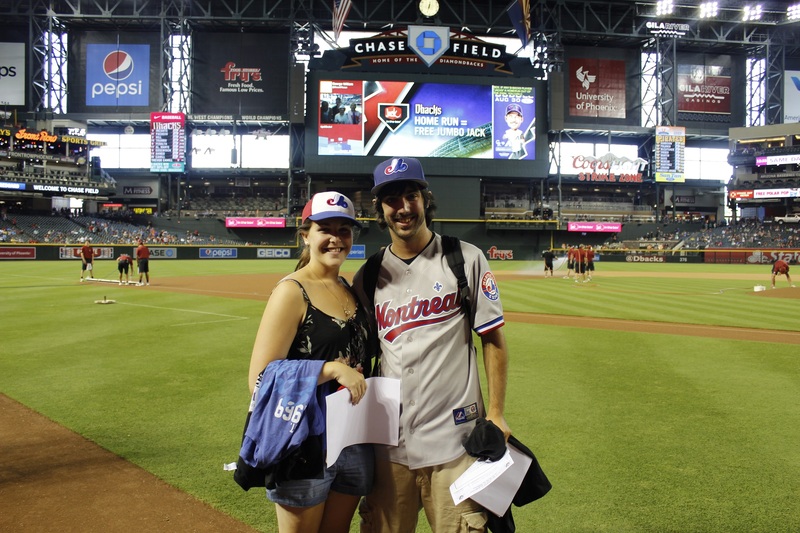 Josh told us that the fan experience in Chase Field was well known. We saw that the employees where happy and polite. And who could forget the pool which is a unique experience in the MLB! 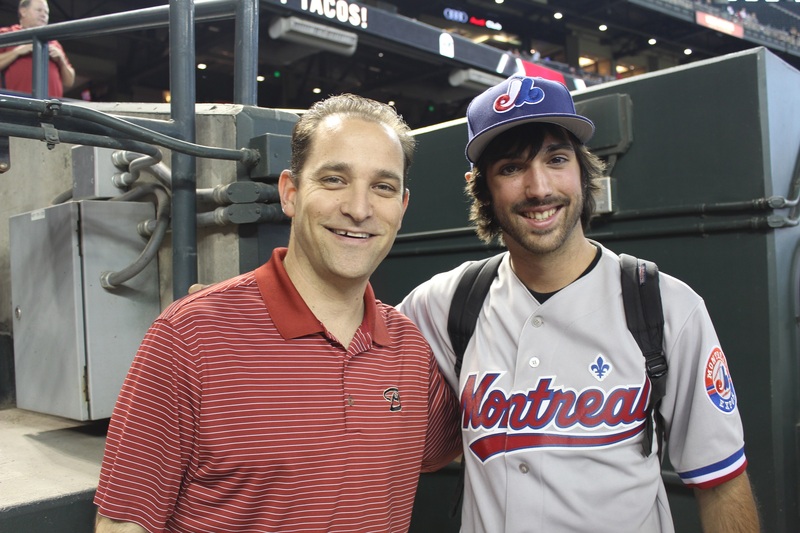 A big thanks to Josh for the visit, it was really nice and we appreciate that you and the Dbacks are supporting the project of bringing a team back to Montreal. 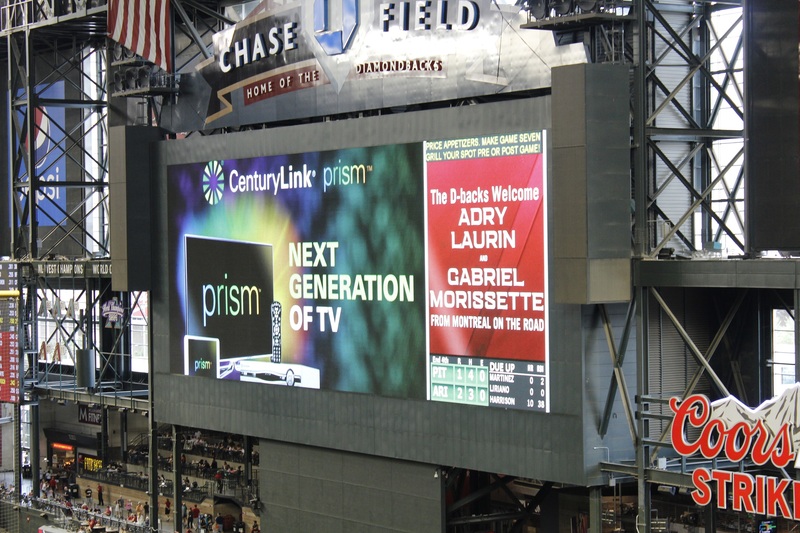 We only got good words from Chase field! Back to our seats (high and far! ), we looked at the game and I decided to, for the first time, fill up a game sheet. Let’s say I needed the help of Adry and from the MLB app on my cellphone to keep track of everything! So for the game, the Dbacks (Pitching: Trevor Cahill) were finishing their series against the Pirates (Pitching: Francisco Liriano). Unfortunately, Paul Goldschmidt, the team superstar, was out of the lineup with a hand injury. After the first Pirates run in the second inning (scored by Russel Martin), the Dbacks answered back in the 3rd with 2 runs. The two pitchers got their game on and no more run until the 8th inning when Andrew Mccutchen hit a sacrifice fly to tie the game. Pirates left a lot of runners on bases yesterday. The Dbacks with players in scoring position in the 9th couldn’t score so we headed to extra innings (free baseball). Dbacks finally won in the 10th on a really weird play: ground ball to shortstop who throws to second to try the double play. The relay hit the sliding player’s hand and never made it to first base. From third base, Tuffy Gosewisch scored for the win. Phoenix was a city that deserved a baseball team. Arizona had a lot of success with the Cactus league (spring camp) and Phoenix was one of the biggest cities in the country without a major league baseball team. 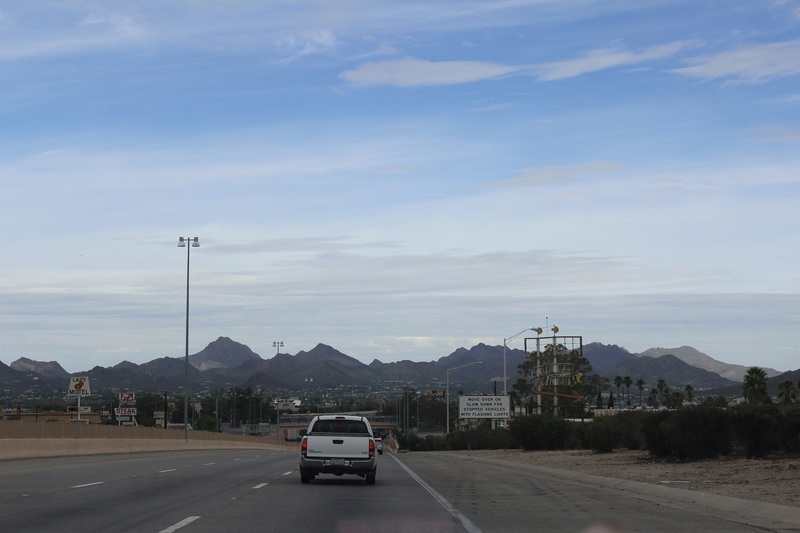 Like Josh and Kevin told us, Phoenix is a city whit a lot of transplants from everywhere in the United States. They moved for jobs or the weather! This is why you will find a lot of opposing team’s fans at Chase field and that is good for the team. We understand that it is an important factor for a successful team to host a lot of fans from the other teams in your ballpark. 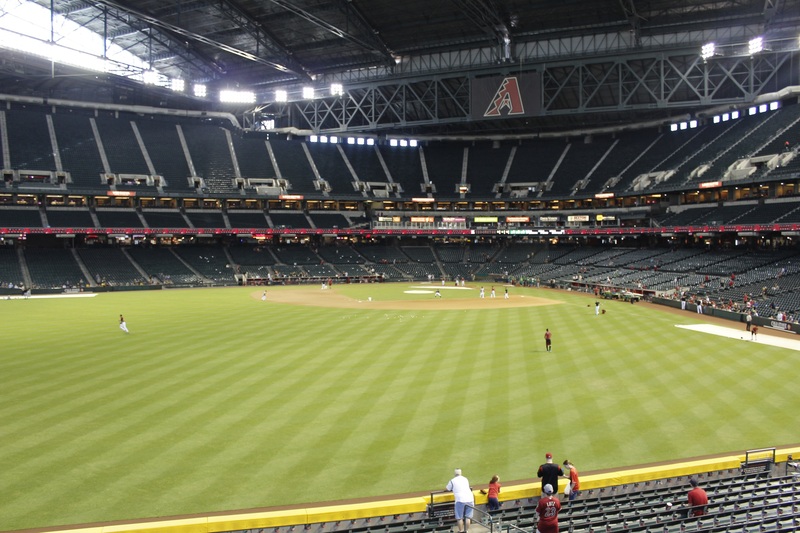 The Dbacks are young and, like we learned in Tampa, it is really important to give time to those young teams so they can develop a fan base old enough to buy tickets. We would like to say thank you to Kevin who got us our first TV spot of the tour as well as introducing us to Josh. It was a pleasure to meet him and talk baseball. He gave us a text that he wrote after the Expos left town, a text filled with emotions from a real fan. Also thanks a lot to Josh and the Dbacks organization that hosted us with such class. 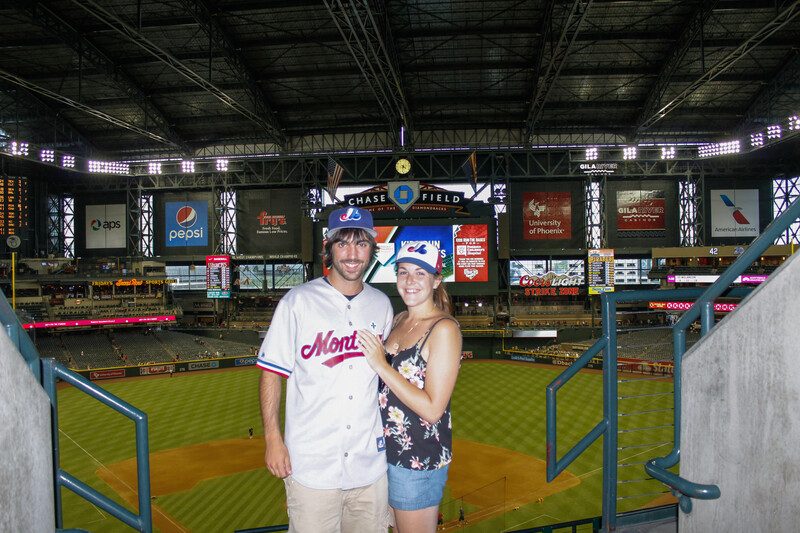 We’ll never forget our experience at Chase Field. We are now heading west to California where we’ll have the chance to attend a game with my sister! P.S. When we headed back to the TV station to say goodbye to Kevin, people in the region where panicking because of a thunderstorm. Those people do not want to spend a winter in Quebec!